Most working professionals remain cooped up in a closed atmosphere all day, breathing the same recirculated air and spending long hours totally disconnected from nature. 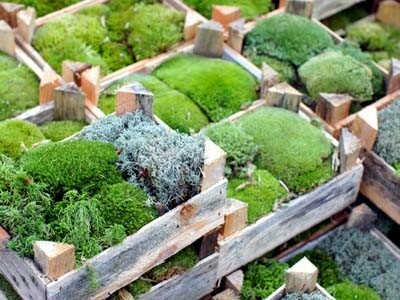 Incorporating a vertical wall garden of moss will address both problems – contaminated air and lack of greenery. Moss cleans the air in the environment, making it the perfect choice for purifying the air in the office. Green moss also brings a bit of nature into the office interior. When HVAC systems in office buildings are not serviced at regular intervals, the recirculated air inside is likely to be polluted and contaminated. A moss wall garden can make the air you breathe indoors more eco-friendly, since it’s a preserved, living plant. It actually can absorb some of those nasty contaminants, so you don’t have to inhale them. Installing vertical wall gardens inside will provide the assurance that you are breathing in cleaner and more natural air from the outside. Similar to how plants work hard every day to clean the pollutants and contaminants from the air outside, a moss garden works indoors to provide a cleaner environment. Studies on moss gardens have revealed that there are no harmful effects of having one indoors. On the other hand, only positive benefits have been proven. Cleaning your indoor air naturally is also a much cheaper process when you have a vertical wall garden. A moss garden is definitely more economical than expensive air purifiers and ventilators that would be required otherwise. Most important of all, moss gardens don’t really need any maintenance.